The consolidation lasted barely three days. Gold’s price dropped below 1250 intra-day during Dec 18-20 but received good support from its 200 day EMA. After easily crossing above the ‘support/resistance zone’ between 1260-1270, gold’s price rose almost vertically – thanks to a falling US Dollar index – to touch an intra-day high of 1300 on Jan 4 ’19. Formation of a ‘reversal day’ bar (higher high, lower close) with a surge in volumes have put a temporary halt to the rally. Some correction/consolidation can be expected after a hectic rally. Daily technical indicators are looking bullish and overbought. 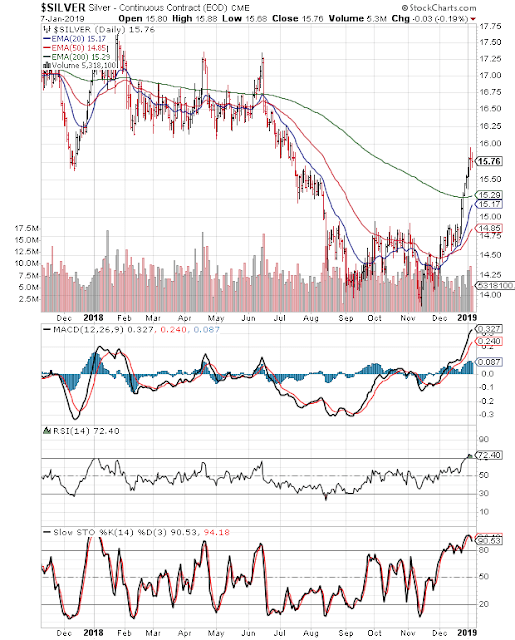 MACD is at the edge of its overbought zone. RSI has slipped down from its overbought zone. Slow stochastic is falling inside its overbought zone. On longer term weekly chart (not shown), gold’s price closed above its three weekly EMAs in long-term bull territory. Weekly technical indicators are looking bullish. MACD is rising above its signal line in bullish zone. RSI is rising above its 50% level. Slow stochastic is well inside its overbought zone, and can trigger some correction/consolidation. A few days of sideways consolidation received good support from the 20 day EMA, followed by a price spurt above the ‘support/resistance zone’ between 15.0-15.25 and the 200 day EMA. After falling just short of the 16.0 level intra-day, silver’s price has made a temporary retreat to 15.76. A pullback towards the 200 day EMA is a possibility. Daily technical indicators are showing signs of correcting overbought conditions. 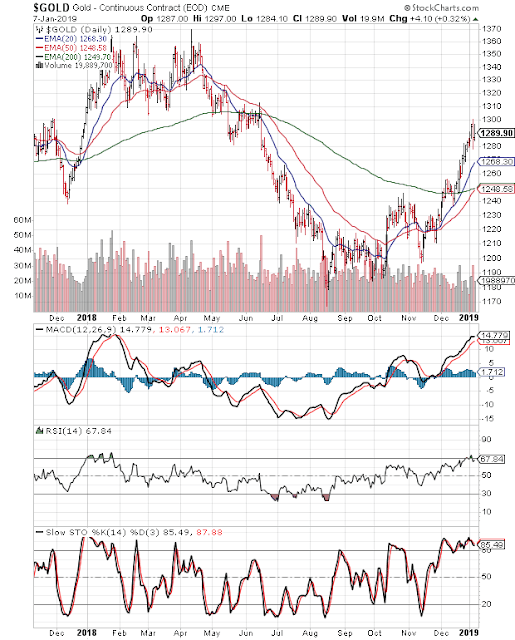 MACD is rising inside its overbought zone. RSI and Slow stochastic have started correcting inside their respective overbought zones. On longer term weekly chart (not shown), silver’s price closed above its 20 week and 50 week EMAs, but below its 200 week EMA in a long-term bear market. Weekly technical indicators are looking bullish. MACD is rising above its signal line in bearish zone. RSI is above its 50% level. Slow stochastic is inside its overbought zone, and can trigger a near-term correction/consolidation.